Icon [Ікона; Ikona]. An image depicting a holy personage or scene in the stylized Byzantine manner (see Byzantine art), and venerated in the Eastern Christian churches. The image can be executed in different media; hence, the term ‘icon’ can be applied to mural paintings, frescoes, or mosaics, tapestries or embroideries, enamels, and low reliefs carved in marble, ivory, or stone or cast in metal. The typical icon, however, is a portable painting on a wooden panel, and it is this form of icon that is discussed here (for other forms see Fresco painting, Mosaic, and Enamel). Technique. The earliest technique of icon painting was encaustic, but the traditional and most common technique is tempera. The paint—an emulsion of mineral pigments (ochers, siennas, umbers, or green earth), egg yolk, and water—is applied with a brush to a panel prepared in a special way. The panel of well-dried linden, birch, poplar, alder, pine, or cypress is 3–4 cm thick. To prevent warping it is reinforced with two hardwood slats inserted in grooves on the reverse side. The face side is slightly hollowed to obtain a concave surface surrounded by a protective border, usually 3 cm wide and scored to provide a better gluing base. It is then covered with canvas, to which several layers of gesso (plaster or powdered alabaster mixed with fish glue) are applied. When an even, smooth surface has been produced, an outline of the painting is traced on it with charcoal or scratched into it with a needle. Gold leaf is fixed to designated areas before painting begins. The paint is applied in successive layers from dark to light tones; then the figures are outlined and, finally, certain areas are highlighted with whiting. After drying, the painting is covered with a special varnish consisting of linseed oil and crystalline resins to protect it from dust and humidity. The varnish imparts depth and richness to the pale tones of tempera but, eventually, becomes dark with dirt. Traditionally cleaned with a vinegar and ammonia solution, the varnish is now treated with chemical solutions that are capable of restoring the original brilliance and depth to the colors. History. With the introduction of Christianity in the 10th century, Byzantine icons and icon painters began to be imported into Ukraine. According to the Primary Chronicle, Volodymyr the Great ordered icons for the Church of the Tithes from Chersonese Taurica. In the following century an indigenous school of icon painting developed in Kyiv. By the turn of the century the Kyivan Cave Monastery Icon Painting Studio could boast of such renowned painters as Master Olimpii and Deacon Hryhorii, who are mentioned in the Kyivan Cave Patericon. In the 12th century the studio's influence was felt throughout Kyivan Rus’—in Galicia, Volhynia, Novgorod the Great, Suzdal, and Yaroslavl. Its distinctive style of painting resembled closely the style of contemporary mosaics in Kyiv. Because of their destructibility by fire and desirability as war booty, many icons perished. Only a very few Kyivan icons from the 11th century (the oldest of them is an icon of the Mother of God with Saint Anthony of the Caves and Saint Theodosii of the Caves that belonged to the Svensk Monastery near Briansk, the so-called Mother of God of the Caves or The Svensk Mother of God), and several from the 12th, have survived to our day. The oldest surviving masterpieces of the Kyiv school include Mother of God Great Panagia, a large icon done probably by Master Olimpii and donated by Volodymyr Monomakh to a church in Rostov; Saint Demetrius of Thessalonica, a 12th-century icon that belonged to the Dormition Church in Dmitrov; Saint Nicholas with Saints on the Borders (turn of the 12th century); and Ihor's Mother of God, a 13th-century work that disappeared from the Kyivan Cave Monastery during the Second World War. There are also a number of icons that belong to the Kyiv tradition of icon painting, but may have been produced in centers other than Kyiv. The most important of these are works that were probably produced by the Novgorod school according to Kyivan models: The Ustiug Annunciation (12th century), The Archangel Gabriel or The Angel with Golden Hair (12th), and Saints Borys and Hlib (12th–13th). The famous Vyshhorod Mother of God, later known as The Vladimir Mother of God, is not a Kyivan but a Greek icon that was brought in 1134 from Constantinople to Vyshhorod, and taken to Vladimir by Andrei Bogoliubskii in 1155. With the rise of the Principality of Galicia-Volhynia in the 13th century, a Galician tradition of icon painting arose. The earliest Galician icons that have survived are from the early 13th century (Mother of God the Protectress). We can assume that earlier icons were painted in a style similar to that of Kyivan icons. The chief icon painting schools in Galicia were those of Peremyshl and Lviv. Each of them had many branches scattered throughout the Carpathian Mountains region as far west as Transcarpathia and today’s Prešov region in Slovakia. Several of such icons dating back to the 14th century and numerous ones from the 15th century have been preserved. Although works of this period are unsigned and undated, some of them are distinctive enough to be attributed to particular studios and masters. Some icons were painted by monks, but most were done by highly trained secular craftsmen or self-taught folk artists. Municipal archives in Peremyshl contain references to icon painters such as Vladyka (1393–4), Matvii (1431–51), T. Drobysh (1443–50), and Yakiv (1443–51), and those in Lviv refer to Stanyslav (1404–12), Ivan and Luka (1406–25), and Andrii (1443–8). Galician icons of the 15th century are characterized by their pure, almost classical, style. The figures are balanced perfectly with the background. The drawing is delicate and refined, and its lines are rhythmic. The forms tend to be rounded. Full-bodied reds, greens, and blues contrast strongly with the prevalent muted colors. The background is monotonic and peaceful, usually light ocher or bluish gray. Gold is used only for the halo. Designs are carved on the halo and, towards the end of the century, in the background. The finest surviving examples of this style are The Nativity of the Mother of God from Vanivka, Saint George the Dragon-slayer from Zdvyzhen, The Archangel Michael and The Archangel Gabriel from Dalova, Saints Cosmas and Damian from Tylych, Christ the Teacher from Mylyk, The Mother of God with the Prophets from Pidhorodtsi, The Last Judgment from Mshanets, Saint Nicholas with Scenes from His Life from Radruzh, and The Mother of God Hodegetria from Krasiv. Fourteenth-century icons such as Saint George the Dragon-Slayer from Stanylia and The Dormition of the Mother of God from Zhukotyn are quite distinct in style. Their simplified figures are flat and have a clear outline. Less is known about icon painting in Volhynia, but the early 14th-century Mother of God Hodegetria from Lutsk shows that Volhynian icons were similar to contemporary Galician ones. 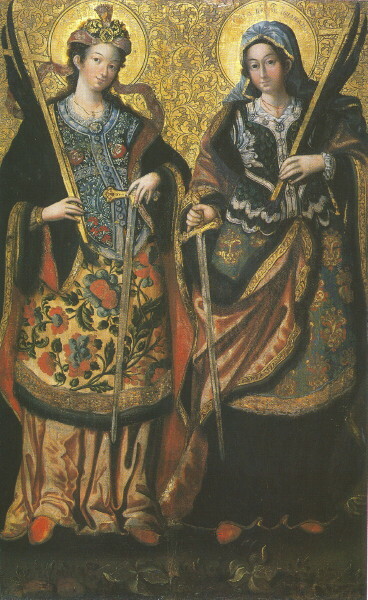 In the 16th century Lviv became the main center of icon painting. The names of many masters whose works have not been identified have come down to us in the municipal archives: M. Vorobii (1524–75), and Khoma (1536–49), Fedir (1539–64), V. Vorobii (1575), and Lavrentii Fylypovych-Pukhalsky (1575–1611) and his sons Ivanko and Oleksander. A number of towns near Lviv (Staryi Sambir, Stryi, Yavoriv, and Rohatyn) developed their own schools. The style evolved towards a greater emphasis of the graphic element, which became typical of Ukrainian icons: figures began to be circumscribed with a distinct line. With a heavier application of whitener, forms became more plastic and rounded. The colors became livelier. The background was colored solid gold or silver and was ornamented with engraved or impressed geometric designs. Among the numerous icons that survive from this period, the finest samples of the Peremyshl school are The Nativity of Christ and The Passion of Christ from Trushevychi, The Annunciation from Dalova, The Adoration of the Magi from Busovysko, The Archangel Michael from Ilnyk, The Dormition of the Mother of God (signed by Master Oleksii) from Smilnyk, Christ with the Twelve Apostles and The Nativity of the Mother of God (both by Dmytrii) from Dolyna, and The Mother of God from Florynka. The Lviv school produced such masterpieces as The Crucifixion with Attending Women from Borshchovychi, The Transfiguration and The Archangel Michael from Yabloniv, Saint Parasceve from Krushelnytsia, The Nativity of the Mother of God and The Descent into Hell from Vyshenka, The Last Judgment and Saint Mark from Kamianka-Buzka, and Saints Borys and Hlib and The Crucifixion from Potelych. Galician artists kept abreast of developments in the Balkans, Novgorod and Moscow in the north, and Western Europe, but it is difficult to pinpoint any concrete borrowings. The first painters' guild in Lviv was organized in 1596 and its membership was restricted at first to Catholics. By the mid-17th century, however, Ukrainian (Orthodox) artists made their way to the top offices in the guild. Specializing in portrait and icon painting, masters were highly skilled artists who had spent several years abroad. The leading Ukrainian painters in Lviv were Fedir Senkovych, Mykola Petrakhnovych, and S. Korunka. A number of provincial schools of icon painting achieved a wide reputation. There were several studios in Rybotychi that combined elements of the traditional icon with elements of Western engraving and left such works as The Last Judgment and The Nativity of Christ. The town of Sudova Vyshnia produced several outstanding painters: Illia Brodlakovych (Vyshensky), Yatsko, and Ivan the Painter. Ivan Rutkovych worked in Zhovkva, and Yov Kondzelevych (born in Zhovkva) worked at the Maniava Hermitage. A strong tendency towards realism in Galician icon painting, that emerged with a particular intensity at the beginning of the 17th century, can be attributed to the influence of Western Europe. The personages in the icons became individualized and the background became filled with natural landscapes. Color contrasts were toned down to obtain gentle transitions. Oil paints were introduced in the second half of the century, usually in combination with tempera. Elements of realism are clearly marked in such icons as The Last Supper (1638) from the Dormition Church in Lviv and The Nativity of the Mother of God (mid-17th century) from the Church of Good Friday in Lviv, and the icons of the Church of the Holy Spirit in Rohatyn. At the beginning of the 17th century icon painting began to revive in central and eastern Ukraine. Numerous, though usually small, local icon-painting centers existed in Right-Bank Ukraine in the 17th and early 18th centuries. A few icons dating from the 1630s have been preserved in the Kyiv region, and several icons from the late 17th century survived in Left-Bank Ukraine. Its patrons were not only the church but also the rising Cossack elite (see Cossack starshyna, Cossacks). The new baroque churches in Kyiv, Chernihiv, and other centers of the Cossack Hetman state were decorated with elaborate iconostases. The Kyivan Cave Monastery became the leading center of icon painting. In the new icons the severe Byzantine style gave way to the dynamic, luxurious, and expressive style of the baroque. The icon of the Mother of God as the Protectress is typical of this period. It depicts the Mother of God covering with her mantle the patrons of the church and other dignitaries of the time. Some examples of this icon portray such hetmans as Bohdan Khmelnytsky, Danylo Apostol, and Pavlo Polubotok with their wives and families. The Zaporozhian Protectress, which was executed in a simple, primitive style, presents the Mother of God with the leaders of the Zaporozhian Host. By the end of the 18th century the icon evolved into an ordinary painting on a biblical theme and disappeared as a distinctive art form. This evolution is apparent in the work of Volodymyr Borovykovsky and Luka Dolynsky. At the beginning of the 20th century, Ukrainian icon painting was revived in a neo-Byzantine form, represented by Mykhailo Boichuk and his ’monumentalist’ school, as well as by Modest Sosenko, Petro Kholodny, Mykhailo Osinchuk, Vasyl Diadyniuk, and others. Since 1948, in the United States, Canada, Europe, and Australia, many churches and iconostases have been decorated in this style by painters such as Mykhailo Osinchuk, Petro Andrusiv, Petro P. Kholodny, Sviatoslav Hordynsky, Mykhailo Dmytrenko, Ivan Denysenko, M. Bilynsky, Myron Levytsky, Jacques Hnizdovsky, Mykola Bidniak, Andrii Solohub, Mykhailo Moroz, the Studite monk Yu. Mokrytsky, and Omelian Mazuryk. Research. The systematic study of icons began only in the mid-19th century. At first icons were viewed simply as archeological objects or a form of handicraft. It was only in the 20th century that they have been approached as artistic objects. This is largely attributable to new restoration techniques, which for the first time uncovered the rich colors and complex composition of old icons, and to improvements in reproduction technology, which made comparative studies possible. The first centers of icon research were Kyiv, with its small but valuable icon collections at the City Museum (see National Museum of the History of Ukraine) and the Museum of the Kyiv Theological Academy, and Lviv, with its rich collections at the National Museum and the Stauropegion Institute’s museum. Comparative analysis has shown that old Ukrainian icons, while based on Byzantine models in theme and style, possessed distinctive national traits and were organically rooted in Ukrainian spirituality.